Automatic Detection and Characterisation of Aluminium Weld Defects: Comparison between Radiography, Radioscopy and Human Interpretation. T. ODIEVRE, M. COURBIERE, C. HANTRAIS; PECHINEY, Centre de Recherches de Voreppe, BP 27, 38 340 Voreppe. In this paper, we present an automatic image analysis procedure for weld defects detection and calibration. The main defects types in aluminium welds are considered : cavities, porosities and lack of penetration. Excess of penetration has also to be detected, but is considered as a normal structure. The developed procedure is either adapted to radioscopic images or digitized films, and the results are compared in terms of smallest detected flaw. On another hand, the results are compared with human interpretation of film radiography (before digitization). The human interpretation of radiographic films is a hard and difficult task when a great number of defects is to be counted and calibrated. It is known that several experts do not have the same opinion on a given film , and even the same expert might have a different report at the beginning or the end of the work day. An automatic software is more reliable in that sense that its decision is not dependent on subjective factors. The objective of this work is to investigate the possibilities of automatic image interpretation of aluminium weld defects by using, as much as possible, classical image processing tools, and without apprenticeship. Image interpretation involves defect detection, calibration and classification according to an internal specification. Lack, excess of penetration and gas porosities are considered. The software is tested on aluminium welds of 6 mm thickness sheet. Image acquisition is carried out either by digital radioscopy or radiography in order to evaluate the limits of defect detection. Human interpretation of radiographic films before digitization is taken as a basis of comparison for the qualification of the software. The automatic procedure for defect detection proceeds mainly in 3 steps : global enhancement of the image, enhancement of specific features and segmentation. More precisely, image analysis consists of 4 blocks, that are detailed hereafter. First of all, the grey-levels are stretched in such a way to use the whole dynamic range. Then, in case the illumination of the object in non uniform, or if the detector response is not the same in all points of the screen, there is a correction in the horizontal direction. During this stage, the grey-levels of the digitized films are inverted in order to be in the same range than radiocopic images (brighter grey-level for defects less dense than the base metal). The limitation of the image to a region of interest (ROI) prevents from the detection of false defects outside the weld. This step requires two inputs : the weld width (or any width chosen by the user) and the pixel size. The procedure finds approximately the middle of the weld as the lowest grey-level of each column (the weld seam is horizontal)1. All the middle pixels are then fitted by a straight line in the mean least square sense. Knowing the width of the ROI and the middle line, a mask is generated and applied to the image. 1 If the weld is overpenetrated, the darkest pixel is the real middle, but if there is an incomplete penetration, the darkest pixel is slightly shifted from the middle. It is not so important as the image is then limited to a width chosen by the user. 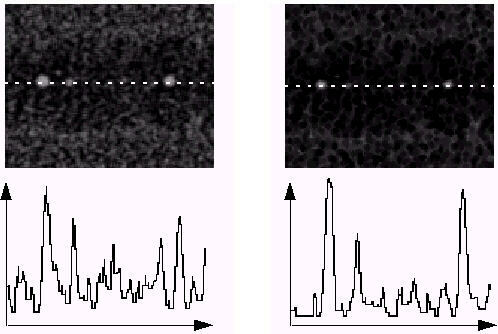 Figure 1 :	Raw images of a lack (a) and excess of penetration (b); c) d) same images after a Laplacian filter and histogram equalization. When looking at the raw image of an incomplete penetration (see figure 1a), it appears that the contrast of such a fine detail is low. After a second order derivative filter (Laplacian), the defect is much more easy to detect, even if the background noise is enhanced as well. The intermediate image containing lacks and/or excesses of penetration is kept in memory, and in case the specification indicates that lacks of penetration are prohibited, the procedure can stop. The filtered and equalized image is no more used in the following, because the noise is too high to detect porosities. The next step begins thus with the image after global enhancement. 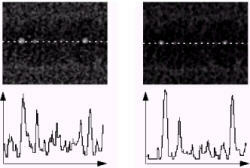 Figure 2 :	a) raw image and vertical profile along a porosity; b) flattened image and corresponding grey-level profile. Figure 2a) shows the typical image of porosities on a digitized radiographic film, and the grey-level profile along a vertical column crossing the defect. The problem is to detect a grey-level variation inside a non-uniform background. To eliminate this non-uniformity, which is due to the normal overthickness of the weld, the image is flattened : a median filter is first applied to smooth the high frequencies of the image (defects and noise) while preserving the low frequencies (weld overthickness); then the filtered image is subtracted to the raw image to retrieve the high frequencies without the low ones. The obtained image is very dark and a logarithmic look-up table (LUT) is applied to enhance the darkest levels. Figure 2b) shows the result, where it is visible that the background is flat. Of course, this process does not change the contrast of the defect with respect to the noise level, because noise and defect are in the same spatial frequency range. At this step, the image analysis is different for big and small porosities. As it is a priori known that porosities have a round shape, we can simulate an ideal porosity by the following mask. In order to appreciate a « round » shape, at least 8 pixels are necessary, that is why this process is only adapted to big porosities (area > 8 pixels). s(x) = 255 - max(ai - yi), where ai are the mask coefficients and yi the corresponding values in the image. This processing can be compared to convolution masking  but is much more simple and quicker because it delivers directly the similarity degree. When applying a convolution mask, a parameter needs then to be computed on the filtered image in order to reveal the degree to which the image contains features that match the mask. Figure 3 :	image before (a) and after (b) correlation with a round shaped mask. The grey-	level profiles show that this method enhance the defects and reduce the noise. The result of correlation is shown in figure 3a) and b) where it is visible that porosities are enhanced. On the grey-level profiles (figure 3b and 3d), it appears that the contrast between the defects and noise is improved by the correlation processing. This is very important to notice because all usual processings tend to enhance noise and defects at the same time. Figure 4 :	Binary image corresponding to that of figure 3. After correlation, the noise level is reduced so that it is possible to apply a global threshold to separate defects and background. This gives a binary image. However, the area of the defects can be affected by the correlation step. To improve the detection, we apply a region growing method  with respect to a reference image (see § 4b). Many growth criteria exist, the simplest one being the comparison of the grey-levels. Finally, the detected regions can be selected depending on their size, shape and grey-level (for example an elongated shape is not expected for a cavity and thus can be eliminated). The obtained binary image (figure 4) is kept in memory. Porosities whose area is less than 8 pixels are considered as noise by the correlation step. Another method has thus to be found from the image obtained after flattening (figure 2b). This image presents too much noise to be thresholded directly. A low pass filter is first applied, with a small window in order that porosities are not so affected. This image is used as reference image for growing big porosities as explained before. For small porosities, we use the morphological top hat transform , but instead of a global threshold, we apply a neighborhood criterion (taking into account mean grey-level and standard deviation). A logical AND is used to have big and small porosities on the same image, thus ready for feature extraction. alignment of three or more porosities : the Hough transform is used to search all the possible lines containing at least three objects, taking into account the size of the objects. The line having the maximal sum of aligned diameters is kept and displayed as overlay on the binary image. Images were acquired on a standard medium resolution device. A mini focus X-ray tube (0.4 *0.4 mm) is associated to an image intensifier. The pixel size at the object level is 166 µm in size, and the geometrical unsharpness is kept smaller (0.15 µm). Operating conditions were optimized to reach the best sensitivity as measured by wire type Image Quality Indicator (3.3 % on 6 mm sheet). Lacks of penetration are detected with good reliability. The smallest detectable porosity depends on the criteria chosen in the software : if very small objects are to be detected, noise is detected as well. For that reason we chose a minimal significant area of 6 pixels. All the objects of less than 6 pixels are eliminated. This is a compromise with the noise detection. With this criterion, the smallest reliably detected porosity is 0.46 mm in size. Of course the detection limit depends on the initial image quality. Films were obtained as indicated by an internal specification, and digitized with 100 ?m step. Of course lacks of penetration were detected, as for radioscopy. The compromise between the limit of detection for porosities and the noise detection is obviously the same than for radioscopy. However, the 6 pixels criterion represents here a smaller object, due to the pixel size. Hence, the smallest reliably detected porosities are 0.3 mm. The films were interpreted by a skilled expert before digitization. The expert was asked to detect porosities of more than 0.2 mm in diameter, to count and calibrate them (with a lens to magnify the defects). The comparison was then done in terms of the total number of detected porosities, the ratio of porosities area over the weld area ( parameter, as described in § 3), and maximal diameter (ø parameter). It is of prime importance to notice that the classification of the welds according to the standard was exactly the same for the software or the expert, either taking the or the ø parameter. The following figure shows the influence of the area criterion used to select only the significant defects. It appears clearly that if we try to detect very small objects, noise is detected also, that is why the number of detected defects is too high compared to the number given by the expert. One weld is particular (n° 233), because very few defects are detected, and for any chosen criterion. In fact, the expert report indicates a lot of very small defects in this weld (ø = 0.2 mm), that are under the detection limit of the software. However, it seems obvious that the number of detected defects is more reliable when a minimal area of 7 pixels is chosen (ø ( 0.3 mm). This is a first step, as it is now necessary to check that the detected objects are actual defects, in order to evaluate the false detection rate. Figure 5 : Comparison of the number of objects detected by the software and the expert. The next figure illustrates the comparison of the parameter, as computed by the software or the expert. As expected, when too many porosities are detected by the software, the ratio obtained is also to important, as the area of porosities is bigger. Some cases are however interesting to discuss on. On the weld n° 233 for instance, the parameter of the software is lower, but the weld is classified correctly because only very small defects are missed, and in the end the porosities area is not so modified (1.2 mm2 on 100 mm of weld). On the weld n° 231, another aspect is interesting : the software detects less defects than the expert, although the parameter looks too high. On the image of this weld (figure 7a) it is visible that some defects are very close together, so that the software detects them as one (figure 7b). That is why on this weld the number of detected defects is smaller than that of the expert, while the and ø parameters are greater (figures 6 and 8). Figure 6 : Comparison of the parameter. 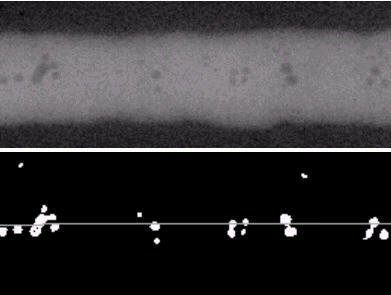 Figure 7 : a)	Digitized film of weld n° 231 where some porosities are very close together b)	Binary image delivered by the software, where close defects are detected as global ones, thus reducing the number of detected defects and increasing the maximal diameter. The comparison of the maximal diameter shows that the image processing developed for big porosities is quite efficient. Indeed, the size of big porosities is estimated correctly, as the mean error is 120 µm, which is close to the pixel size. Moreover, the diameter is either over or under estimated, which indicates that the software does not systematically grow the defects. Thus, we can assume that the criteria integrated in the region growing procedure (§ 2.4.a) are reasonable. Figure 8 : Comparison of the ø parameter. comparison on more welds, following the availability in the industrial site. NOCKEMAN C., HEIDT H., THOMSEN N., Reliability in NDT : ROC study of radiographic weld inspections, NDT&E International, 1991, vol.24, n°5, p.235-245. KEHOE A., PARKER G.A., An intelligent knowledge based approach for the automated inspection of castings, NDT&E International, 1992, vol.25, n°1, p.23-36. SKINNER D.R., BENKE K.K., CHUNG M.J., Application of adaptive convolution masking to the automation of visual inspection, IEEE transactions on robotics and automation, 1990, vol.6, n°1, p.123-127. HORAUD R, MONGA O., Vision par ordinateur, Paris : Hermes, 1995, 425 p.
SERRA J., Image analysis and mathematical morphology, New-York : Academic Press, 1984, vol.I, 610 p.